Arriving without the noise of prestige series, Counterpart stealthily sidestepped any hype to emerge as one of this season's best new dramas. Part espionage procedural, part speculative fiction, it's neo-noir with overtones of Cold War dread, infused with our own paranoia. As the story unfolds, the working of the alternate universes veers from expected logic. (No spoilers!) Characterization is emphasized over exposition, which makes Counterpart all the more compelling as both drama and thought experiment. Few of those aware of the time-split know why one reality was duplicated. "Well, maybe somebody knows. But they're not telling," says milquetoast company man Howard Silk, played by Academy Award-winner J.K. Simmons. Silk is a minor Berlin civil servant who never strays from routine, suiting up to exchange coded messages with a fellow functionary through a glass wall, day after day. The first episode establishes the mechanics of their interface with the creeping existential dread of Alan Bennett's Kafka-esque drones in The Insurance Man or a more drab take on Jacques Tati's Playtime cubicles. The shaped-by-happenstance Silk becomes a Hitchcockian man who knows too much. A chance event puts his life on a different course, letting in doubt—along with an inconvenient twin. The "other" Silk isn't languishing in paperwork. He's a rogue field agent and wily loner. Rooting out a mole elicits confrontations and collaborations between the two Howards, who awaken latent character traits in each other—and grow more and less alike in confounding ways. 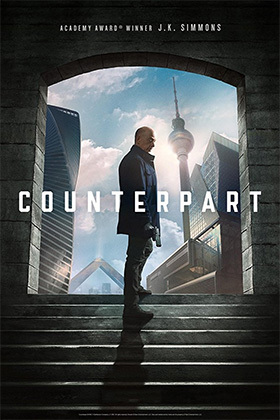 Counterpart demands twice the work from much of its cast, like Harry Lloyd (The Theory of Everything) as Howard's youthful, amiable fixer and the inscrutable Ulrich Thomsen (Small Town Killers, The Substitute). As his wives, Olivia Williams goes shoulder-to-shoulder with Simmons, who in playing himself twice is riveting tenfold. Initially, he creates two very different characters through small but significant physical distinctions and vocal inflections. One is slope shouldered, responsible, and meek. The other boasts a long confident stride and vents plenty of spleen. But as movies like The Dark Mirror and A Stolen Life have taught us, it's never that simple. Soon, even the observant viewer will find it difficult to tell the two Howards apart. You can almost hear the mental 'click' from the doppelgängers at the possibilities considered with each glimpse of their shared past memories, of the lives they might have lived, of the person they might have become. 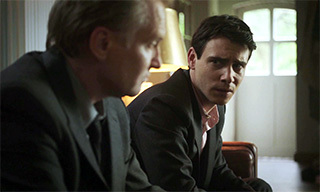 As the season finale approached, the premise hadn't worn thin having been stretched in unexpected directions by Simmons' performance(s). It helps that for creator Justin Marks (abetted by a team of directors including The Imitation Game's Morten Tyldum, who helmed the premiere episode), Berlin looms as menacingly as The Third Man's Vienna, while its reflection is a sallow, depopulated cityscape, the streets and brittle buildings echoing the emptiness. There's a formidable control of atmosphere throughout conveying alienation not just with long shadows and enigmatic figures, but by suggesting disappointment and duplicity lurk around every new dark corner, whatever side you're on. Nathalie Atkinson is a Toronto-based freelance culture writer and film critic, as well as a columnist for The Globe and Mail, Canada's daily newspaper. A member of the Toronto Film Critics Association, Nathalie is also the creator and host of the popular film series Designing the Movies.